The City of Rocks State Park IS a page right out of history. This natural wonder was created millions of years ago, a product of a volcanic monstrosity. The searing fragments piled high forming giant masses, a sort of welding process. Eventual erosion created the pillars and other various rock formations we see today. There are still signs of early inhabitants throughout the area, most notably grinding tools. 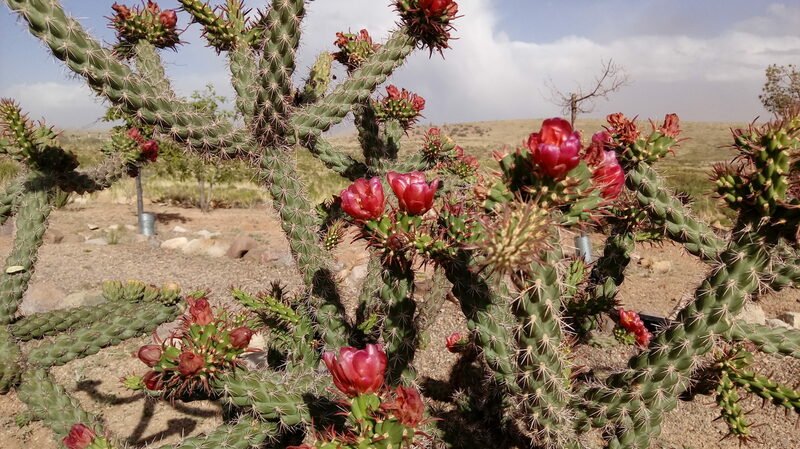 Wildlife and vegetation specific to the Southwest bring life and variety to this bedrock. Made an official state park of New Mexico in the early 1950s, City of Rocks is a mere one square mile in the vast Chihauhuan desert. It sits at an elevation of a little over 5,000 feet. 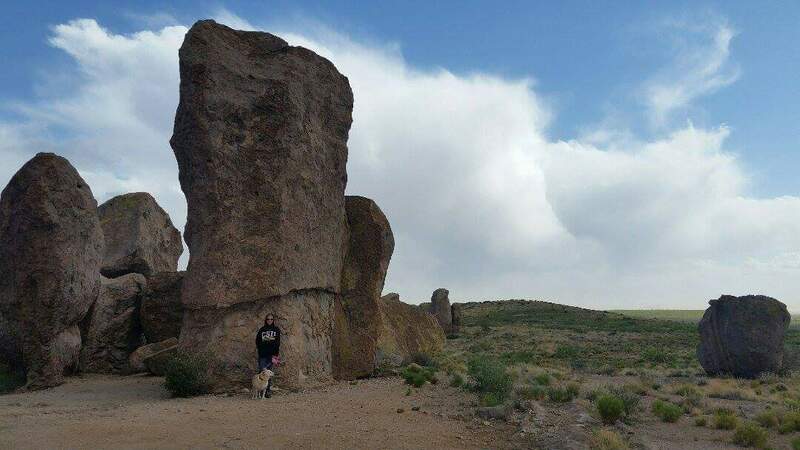 The park is a popular destination for campers, hikers, bicyclists, anthropology and geology buffs, and star gazers. Pillars stand as high as 40 feet. Brewy and I stand in front of one for perspective. 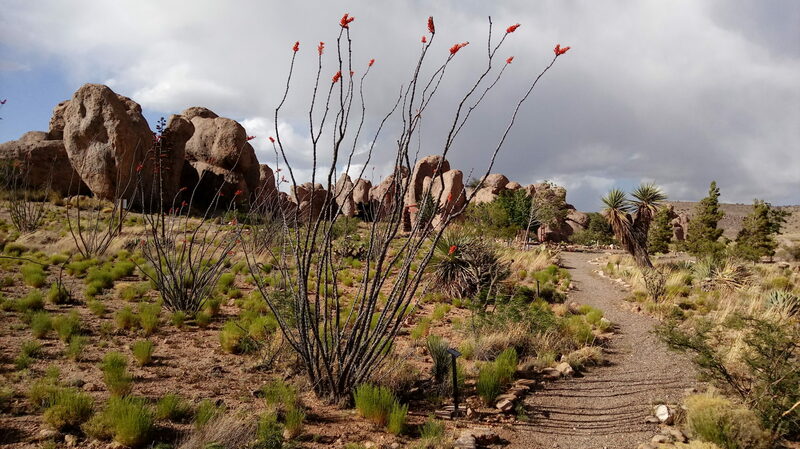 The City of Rocks State Park showcases their flora and fauna in the botanical garden. There are a number of trails that zigzag through and around the park; hiking and biking are encouraged. We happened upon the City of Rocks State Park during our epic journey from South Texas to Central California (May 2017). Long travel days and nights staying at truck stops were getting to be old. We wanted to reach our end destination, but we also wanted to stop and enjoy our surroundings. 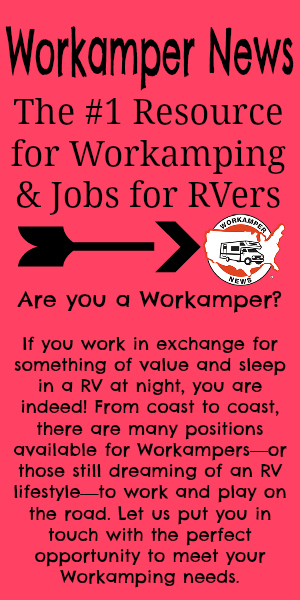 After all, isn’t that what full time RVing is all about? We found the state park using Allstays.com; this website (also an app) has been quite handy as we travel from one work camping job to the next. Allstays allows travelers to plan their routes with information on road grades, bridge heights, overnight stays, dump stations, and propane availability. A one year subscription of around $30 allows customers access to tens of thousands of overnight and extended stays all across the U.S. For a one time fee of about $10, customers can access a sort of Express version of AllStays via app on their I-phones or Androids. Levi created a mini tutorial that outlines the many features of AllStays and helps users locate campsites and resources along their journey. The entrance to New Mexico’s City of Rocks. 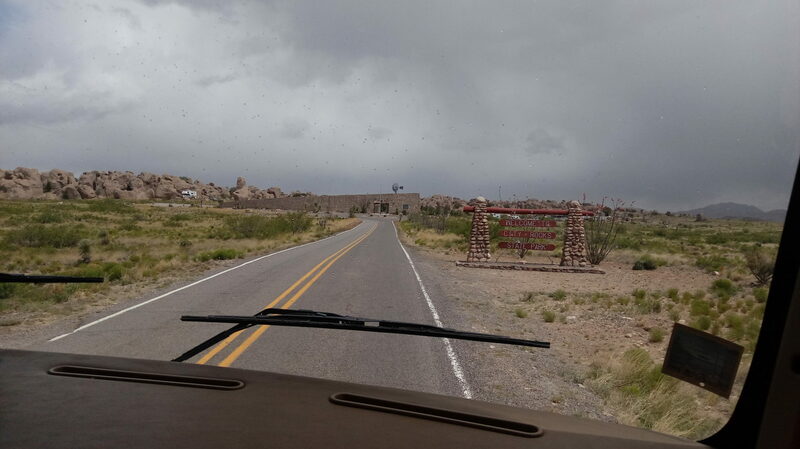 City of Rocks State Park is located roughly 30 minutes north of Deming, the southwest region of New Mexico. Levi and I headed westbound on Interstate 10 before making a right (northwest) on US 180. We stayed on US 180 for approximately 25 miles before making another right (northeast) on NM 61. The park entrance is another 3 miles. I’m not going to lie, the ride up US 180 was rather treacherous that particular day. We arrived on the cusp of a storm and ran into westerly winds of what seemed like 25+ mph. That was after the brief hailstorm; just our luck. We made it to the park entrance a bit rattled but safe and sound, nonetheless. The roads coming in are well paved and park signs are prominently posted along the route. We called earlier that day to inquire about availability. Summer vacation was another couple of weeks away and we were traveling in the middle of the week, so we were feeling confident. Sure enough, there were plenty of dry camping sites, but no guarantee on a site with electricity. We were fine with this as we had a generator and plenty of propane. We didn’t foresee using our A/C with the cold front moving in, also. There were several non-hookup sites available; we settled on a nice pull through overlooking the desert valley and distant mountains. 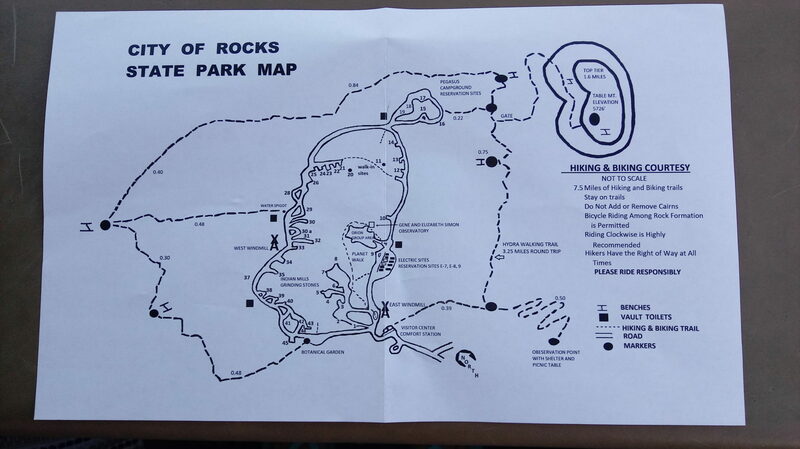 Map courtesy of the visitor’s center designating camping spots, trails, and exhibits. The longest and perhaps most strenuous hike leads up to Table Mountain, but the journey is worth the effort with the breath-taking views! The visitor’s center is a wealth of information on the City of Rocks and surrounding area with its many displays, video documentary, fact panels, and personal stories of the rangers. Outside exhibits like the park’s botanical garden, windmills, and Indian Mills Grinding Stones reveal the region’s history and thriving life. The City of Rocks State Park is also a designated International Dark Sky Park. 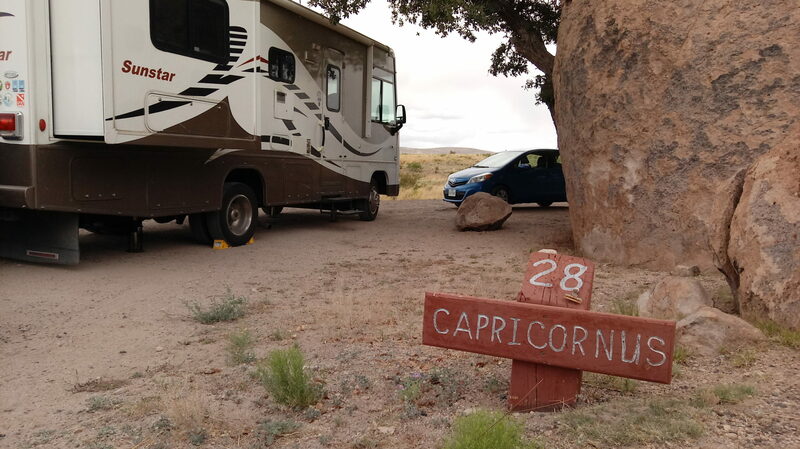 A section of their park is devoted to star gazing equipped with an observatory, planet walk/trail, and community programs; plus, each campsite is named after a constellation. Since we stayed during the week, we unfortunately missed the weekend star viewing program. Astrology experts come to the park Saturday evenings for informal “galaxy talks” and invite enthusiasts to observe the night sky through high power telescopes. For those of us who want to spend a few days in the park, campsites are available. There are a little over 50 developed campsites, 10 of which are equipped with electricity and water hookups. Dump stations are not at one’s disposal (no pun intended), but the rangers can direct RVers to the nearest ones in nearby cities. Each campsite is furnished with a fire pit and picnic table. Our personal thoughts on the sites: Yes, having an electric outlet and water right outside the rig is very convenient, but the dry camping spots are so spread out and private compared to the cramped quarters of the electric/water sites. Full service his and hers bathroom and shower facilities are located across from the visitor’s center. Vault toilets, trash cans, and water sources are situated throughout the grounds. These facilities are handicap accessible, as well. The following fees were taken directly from our park flyer from our visit in May 2017. We couldn’t beat the price…especially with the priceless adventures and memories we took away from the two night stay. Additional vehicles aside from the one towing or being towed was an added charge. 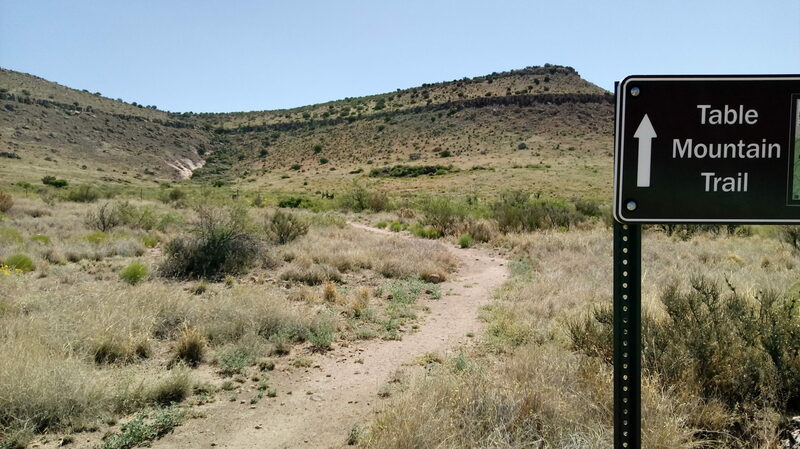 If this is a destination you are interested in visiting, reservations can be made online at www.nmparks.com or by calling 1-877-664-7787. Again, reservations are not necessary, unless an electric hookup is warranted. We did not set up a campsite previously and simply paid upon arrival. There are pay stations located at the entrance of the park and near the visitor’s center. We simply filled out a receipt with our license plate info and included the payment before slipping it into the payment box. 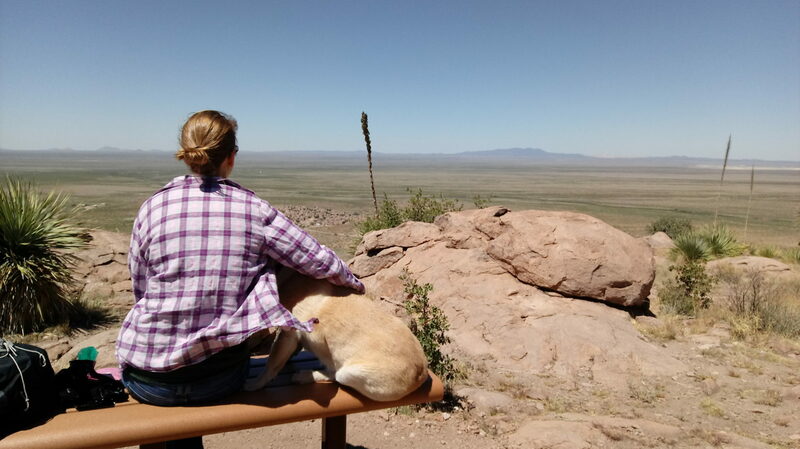 Brewy and I taking in the beauty of the New Mexico desert atop Table Mountain. Levi and I were pretty impressed with the upkeep of the state park. It was apparent that the staff took pride in preserving this part of history. The facilities were immaculate and cleaned daily, toilets and showers. Not a speck of trash was found on the trails or campsites. Trash cans are located at almost every camping spot for convenience. The staff drove around a few times a day for maintenance, clean up, and even security. Conservation is advocated, as well. Recycle bins are located throughout the park and water use is minimized for shower use. 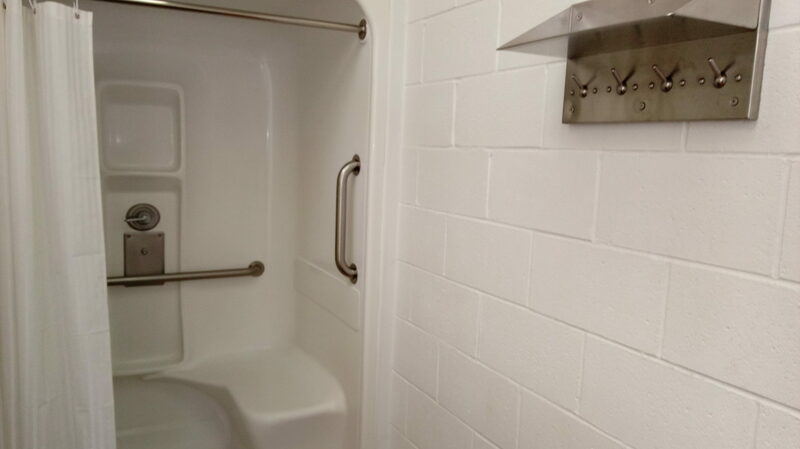 I was a bit baffled the first time I used the facility’s shower. One button allowed warm water to flow out for about 3 seconds. Rinsing off was a chore, but I got the hang of it on the second night! Taking a shower was its own adventure. 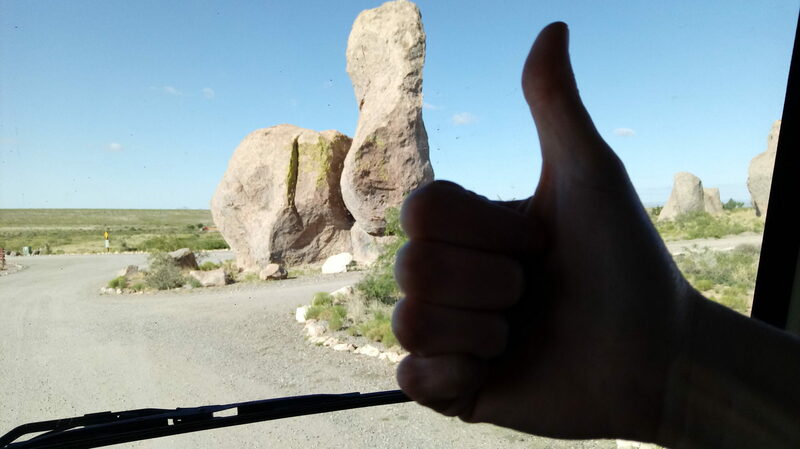 Overall, our experience at the City of Rocks was rockin’, a definite two thumbs up or (as I have rated in previous campground reviews) four out of four tires! The rangers and staff were well versed in the park’s history and took extra care to keep the campground and surrounding areas in tip top shape. Visitors could discover the park in a number of ways from exhibits to nature walks and biking adventures to night sky exploration! Our campsite was private and had the most magnificent views of mountains, sunsets, and wildlife hopping and swooping about. This must be one of the reasons New Mexico is known as the Land of Enchantment. A definite two thumbs up for this camping venture! If you found this review helpful and would like to read more reviews on RV stays and nearby attractions/activities, visit our Travel Guide page. Our main source when planning journeys between work camping gigs is Allstays. For more information on this program and application, view our video here.